Cozy Luxury Family Condo - Corner Unit with Views! All the comforts of home after a day of skiing, golf, mountain biking or a wide array of outdoor or indoor activities! 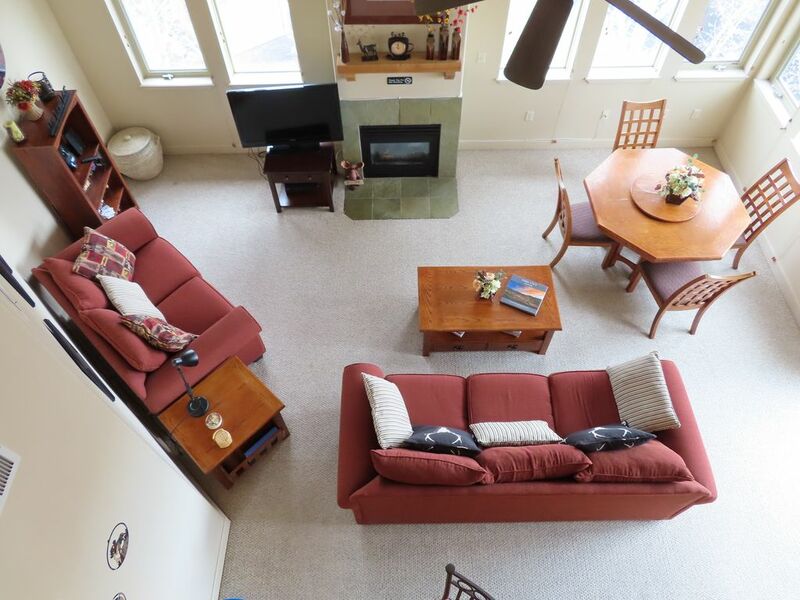 This top floor corner unit is 1500 square feet, has beautiful mountain views along with two bedrooms and a loft, comfortably sleeping 6 people. With 4 TVs, DVD and VHS players and high speed wireless you'll have all the technology you need. A well equipped kitchen and patio deck barbecue provide the perfect environment for great meals. There is a washer and dryer allowing you to pack light. The large private master bedroom includes a Queen size bed, bathroom with two sinks and two walk-in closets. Great location next to the elevator with heated indoor garage parking below. The clubhouse, workout room, hot tub and pool are just a few steps away. The Olympic Park and Canyons Ski Resort are just a 5 minute drive and Park City Mountain Resort and Deer Valley are just a ten minute drive away. Alton, Solitude and Brighton are a 30 minute scenic drive to the other side of the mountain and Salt Lake City Airport is also 30 minutes away. This unit is equipped with air conditioning for the Summer months with a bike/hiking trail right behind the complex. The Tanger Outlet shopping mall is right across the street. Nearby health clubs offer tennis, basketball, swimming, etc. at reasonable rates. There are many beautiful golf courses. Enjoy the movies and many restaurants at Redstone Center across the road. Downtown Main Street in Park City is just a ten minute drive. This is truly a home away from home! Have a large group? The twin condo directly across the hall may be available. Call for details. No smoking. No Pets. Security Deposit Required. I love outdoor activities from the mountains to the beach and the tennis court to the golf course. Utah is a wonderful place to explore with my family! Park City is home to skiing, golf, tennis, hiking and all the things we enjoy. It's a great getaway for us and a good rental location for vacationers from around the country. Our condo is our home away from home with all of our luxuries and the Crestview complex is great with a pool, spas, near shopping, etc. It's a very roomy condo and our family loves it! Great unit with all the amenities you need! Easy access to Park City ski slopes and Historic Main Street. Unit sits adjacent to Tanger Outlets. Easy to communicate with owner (who genuinely cares about your stay). Bedroom TVs could definitely be updated to current technology. They are difficult to see and hear due to low resolution and sound. Other than that, the unit has everything you could ask for! Thank you for the nice review! We hope your family returns for another vacation! This condo was perfect for our family. Karin was available for any questions. I would stay here again. This condo is so comfortable, cute, clean and inviting. We didn't want to leave! Our entire family was able to come and stay and everyone had a wonderful time. We'd definitely come here again! Thank you for the nice review! I am so glad you loved our place and I hope your family comes again! Thank you for the nice review Susan! I am so glad your family enjoyed your stay!! We were very pleased with the arrangement of the property....and it is well appointed with clean and eye pleasing furniture. There was plenty of room and lovely views. This condo is well maintained and we truly appreciated that. You are located near shopping and restaurants but most of all a short travel into the mountains for whatever activity you choose. We love the area because it is so diverse with the wide open spaces! Nature abounds. We hope to use this property again!! Thank you for such a nice review! It was a pleasure having your family enjoy our place. I hope you are able to come again! Thank you Phillip! Please come visit again! Near Canyons Ski Resort, Olympic Park, Redstone Shopping Area (with restaurants, movies & bowling) and Outlet Mall. Ten minutes from downtown Park City, Park City Ski Resort, Deer Valley. The best snow on earth for skiing, Sundance Film Festival, golf, bike trails, hiking, horseback riding, ballooning, Art Festivals, Outdoor Markets, Rodeos, etc.